Well, today saw my last teaching session on my Cardiff University module Physics of the Early Universe. It was actually an optional revision lecture, during which I went through questions on last year’s examination paper, some matters arising therefrom and some general tips on `examination technique’. The latter included advice that seems obvious – such as `read the question carefully’ and `check your numerical answers’ – but that surprisingly many students seem not to have heard before or, if they have, choose not to follow! Anyway, I hope the students who came today found it useful and I hope that they (and indeed everyone else taking examinations over the next few weeks) do themselves proper justice and get the results they need for whatever comes next in their plans. The Physics of the Early Universe paper is a couple of weeks ago so no doubt I’ll get a few more queries to deal with before then. Anyway, today was not only the last teaching session for this particular module – it’s also the last teaching session I’ll ever conduct in the UK university system. Best wishes to whoever it is that teaches this module next year when I’m in Ireland. This entry was posted on May 10, 2018 at 2:43 pm and is filed under Biographical, Cardiff, Education, The Universe and Stuff with tags Cardiff University, Cosmology, Physics of the Early Universe. You can follow any responses to this entry through the RSS 2.0 feed. You can leave a response, or trackback from your own site. Seems bit difficult to me. Is it for B.Sc/M.Sc students? It’s for MSc and 4th year MPhys students. In my extremely limited experience, if at all it counts, most students can reproduce derivation done in class but find it relatively difficult to apply these concepts. some physics but had to learn astrophysics, statistics and programming. 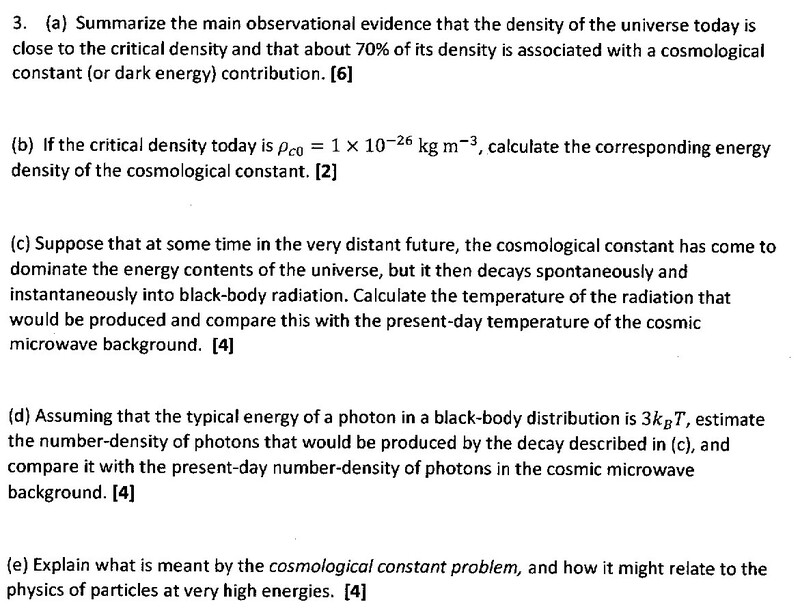 At least there are many good cosmology books.